Why are 80 percent of our congregations stagnant or dying? There are a variety of reasons. This book dives deeply into one of the main reasons--the failure to adapt to the cultural changes of our day. When the Reformation began 500 years ago it sparked a number of radical changes (like worshipping in the vernacular rather than in Latin, etc.) that shocked the church. Over time many saw the merit of those changes and adapted. In the very same way today, major cultural changes are taking place. Is the church open to understanding those changes? And are congregations making the necessary effort to appropriately adapt to them without compromising our central message, the Gospel of Jesus Christ? This ""transformational manual"" addresses the cultural shifts and provides practical and experience-based ideas to appropriately respond while keeping a strong emphasis on the Gospel of Jesus. Are you ready to become a 21st century church? J. Fred Lehr has always focused on making the church all it can be. A student of cultural attitudes, organizational systems, and in general the practical aspects of being the church, Lehr has concentrated his recent efforts on understanding the impact of the postmodern church and how we can successfully and faithfully respond to that major cultural shift while still being true to the Gospel of Jesus Christ. 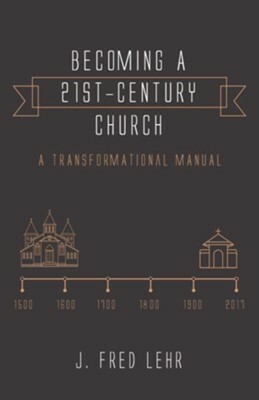 I'm the author/artist and I want to review Becoming a 21st-Century Church.